The Lord Jesus Christ is the Divine Physician of our souls and bodies. He willed that His Church, in the power of the Holy Spirit, should continue His ministry of healing and salvation. Therefore, He instituted the Sacrament of Reconciliation for all sinful members of His Church (Catechism of the Catholic Church, 1421 & 1446.) The Sacrament of Reconciliation—also known as Penance or Confession—is the ordinary means by which Christ’s faithful who are aware of serious sin are reconciled to God and His Church after Baptism. Every Catholic after attaining the age of discretion is bound by obligation to confess serious sins at least once a year (Code of Canon Law, cann. 960 & 989). Parents, as models of faith and Christian witness and in virtue of their duty as the primary educators of their children, are to be actively and intimately engaged in preparing their children for the first reception of the Sacrament of Reconciliation. Parents and children attend the catechetical sessions provided by the parish which include: a theology of the Sacrament, the psychological and spiritual development of children, the norms for celebrating the Sacrament, and the roles of all involved (Archdiocesan Pastoral Polices Handbook, 3.2.4.5.a). At St. Charles Borromeo, our program for preparation for First Reconciliation includes a set of six (6) catechetical sessions and one (1) retreat day for parents and their children. The program will be offered three times each year: once in the fall, once in the spring, and once in the summer. 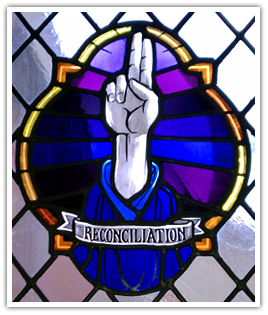 First Reconciliation will be celebrated at the conclusion of each program. Child must be Catholic and be open to receiving the Sacrament. Child must be at least seven (7) years old. Child is concurrently enrolled in and attending the monthly Family Faith Formation program with at least one parent. Child is attending weekly Sunday Mass with parents and knows how to participate in the celebration of the liturgy. Child should know basic prayers: Sign of the Cross, Our Father, Hail Mary, Glory Be. Parent completes and submits the “Request for Sacramental Preparation” form (see buttons below) by the registration deadline along with a $20 program fee.